Abstract: A dedicated Inter Terminal Transport (ITT) system must be able to efficiently transport containers inside the port area over a separate road preventing congestion on the ports entry roads, bundling incoming and outgoing container demand, and increasing competitiveness of the port. In this paper, a technique for decision support when designing inter terminal transport systems is proposed. In particular, a deterministic minimum cost flow model with time expanded graphs is presented. The model is able to support the design phase by quickly calculating an optimal vehicle configuration minimizing delays, saving time and money in the early phases of planning. 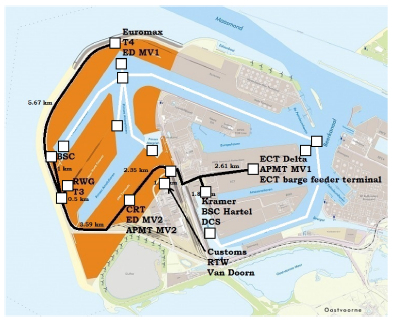 In order to illustrate the potential of the model, it is applied for the proposed ITT system at Maasvlakte 1 and 2 areas in the Port of Rotterdam. The optimal configurations, as well as impact of various parameters, are determined. Reference: F. Nieuwkoop, F. Corman, R.R. Negenborn, M.B. Duinkerken, M. van Schuylenburg, G. Lodewijks. Decision support for configuration determination in Inter Terminal Transport System design. In Proceedings of the 2014 IEEE International Conference on Networking, Sensing, and Control (ICNSC 2014), Miami, Florida, pp. 613-618, April 2014.